We live in the desert. 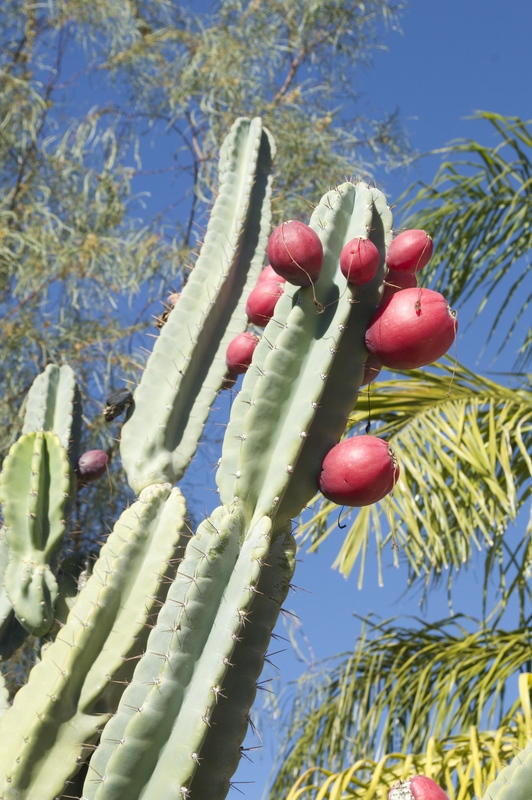 When we go to our botanical garden, we see cacti, succulents, and all sorts of interesting desert plants. 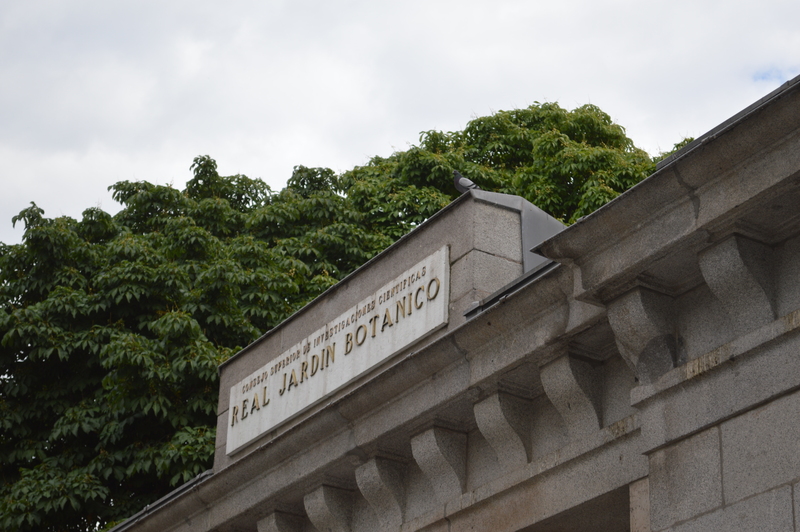 In Madrid, the botanical garden is quite different. There are tall, shady trees. There are fountains and ponds. And of course, there is a wide variety of plant life that we just don’t get to see at home. It was a feast for our eyes, and a tranquil place to explore near the end of the day when our children were tired of museums and just wanted to run around enjoying the outdoors. Our two year old moved from spot to spot drawing interesting shapes in the dirt. The older two girls ran around, climbing on rocks and fountains, tenderly touching flower petals, and jumping off the benches. It was a great way to end a day of site seeing. I really love the idea of gardens in the middle of busy cities like Madrid. In New York, Central Park is a haven to experience nature in the midst of a major metropolitan city. Boston’s Public Gardens are a beautiful juxtaposition to the gritty city outside its gates. 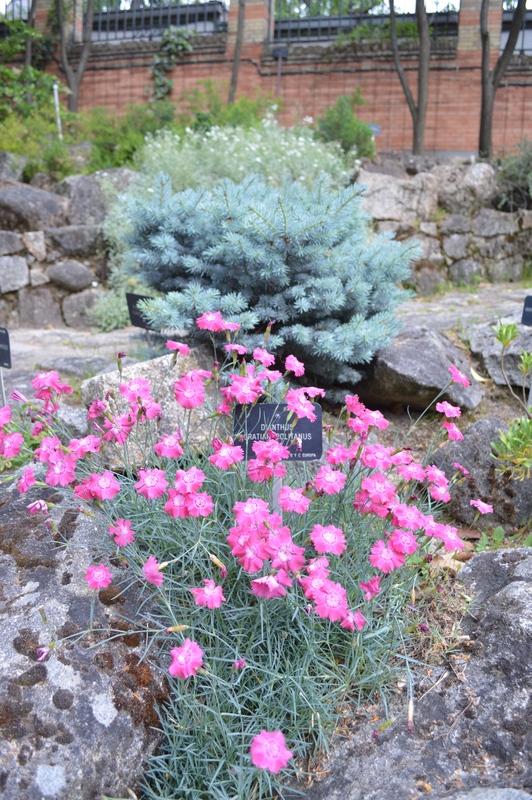 Madrid’s Botanical Gardens offer the same respite from the busy city. 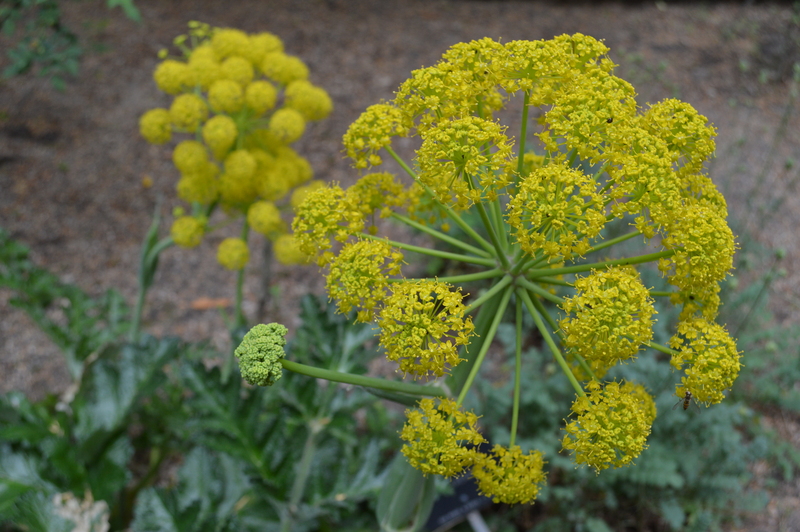 Here are some of my favorite photographs of the gardens. 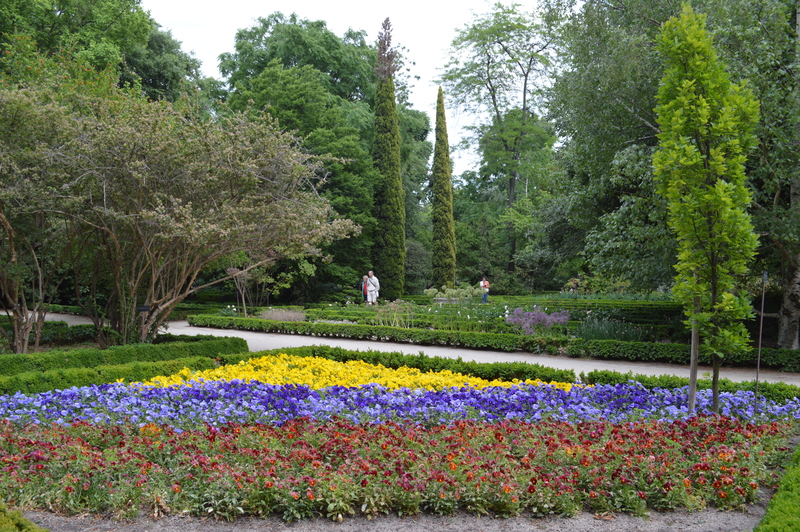 What are your favorite public gardens? If you live in a city, where do you go to experience nature? I must admit, in the past I have not really enjoyed medieval art. In the Met in New York, the medieval section was just an area to walk through as quickly as possible. Never did I feel the urge to linger and gaze upon medieval art there. It always felt too dark, too sombre. The human figure was not as exact as in later Renaissance art. Medieval art seemed to be very expressionless to me. The Prado in Madrid was a completely different experience. Maybe it is because Spain was the world power during medieval times. Maybe medieval artists working in Spain were more skilled at their craft. Maybe it’s because I am a different person now. The medieval art in the Prado was my favorite section of the museum. Beautiful canvas after beautiful canvas in deep, rich colors celebrated the life of Christ and other religious figures. The paintings provided an opportunity for me to speak to my children about scripture stories, the story of Christmas, and the importance religion played in the history of Spain. The rich visual material piqued their interest. While I’m glad that the scriptures are now available for all to read, I appreciate how these vivid depictions of scriptural content sparked conversations and learning opportunities. What really spoke to me personally in the medieval art, were the many paintings of Mary nursing baby Jesus. Since I am currently nursing a baby boy, it makes sense that I would have a more personal connection with the subject matter. What really impressed me was the gentleness and tenderness that was portrayed in the relationship between mother and child. Painting after beautiful painting showed the loving bond shared by mother and child. I have always thought of medieval times as somewhat austere and stern. In some ways, they probably were. But the natural relationship of mother and small baby was regarded as natural and beautiful. It drew me in and touched me. What a beautiful thing it is to care for and nurture a child! It can be daunting, frustrating, tiring, and sometimes monotonous. But tender moments bring joy greater than any of the negative feelings that sometimes come. So hooray for medieval art and the Prado! If you don’t go, you will be missing out on a beautiful visual treasure. Today I was cleaning out my guitar case, and I found a poem written on a loose leaf notebook paper. I have no memory of writing this, but it is in my handwriting. Rereading it, although some of the cadence is a little sticky, I really liked it. So here it is to share with you, revision free. The future lies open, which path shall I take? Converge, and which way shall I veer? Princesses, fairies, mermaids, unicorns! If your little girls are anything like our little girls, they love to dress up and make up games using these personas. I love how vividly their imaginations work, and how creative they are in their stories. But for our little Aeryn, age two, it is more than just make believe. She truly believes that she is a princess. We chose to visit the Royal Palace on our first full day in Madrid. Our children were still jet lagged, and we needed some interest on their part to motivate them to explore with us. They perked up noticeably at the prospect of visiting a palace. So we hopped on the subway and traveled up to Puerta del Sol. Then we walked down Calle del Arenal, past Teatro Real, to find the Royal Palace. 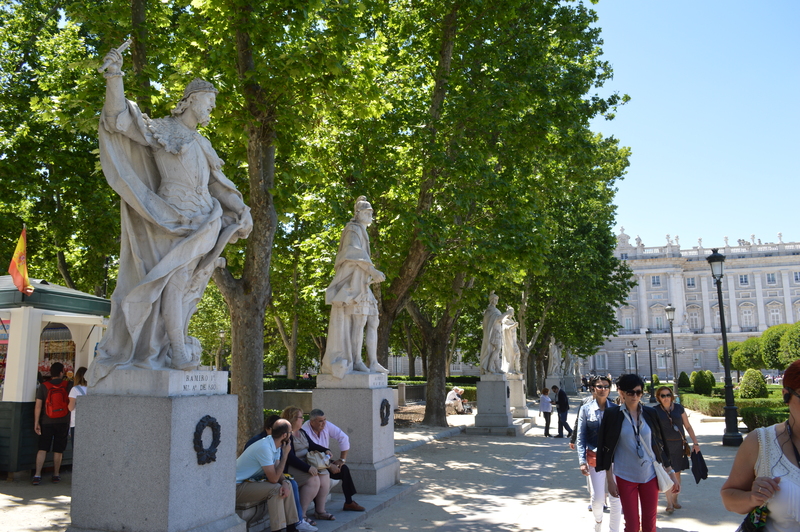 Beautiful gardens in the Plaza de Oriente decorate the approach to the palace. Statues of Gothic kings line the walkway that leads to the front entrance. The Palacio Real is one of the attractions you can visit using the Madrid card. 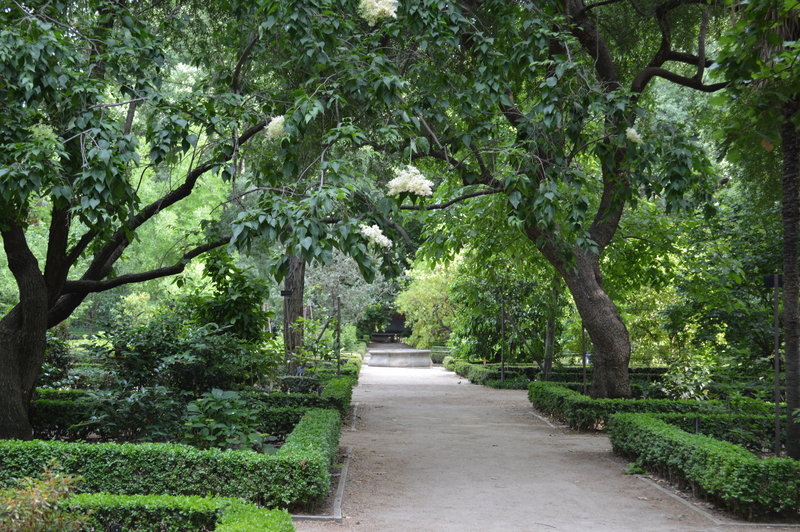 The entrance in the front by the gardens is used exclusively by tour groups and Madrid card holders. There was no line when we got there, so we were able to go right in. There is some security, a metal detector and guards which will search your bags before entering the open courtyard. The palace is beautiful. It was built in the 1700’s, to replace the old castle destroyed in a fire. The beauty of this palace was in part inspired by the beauty of the palace of Versailles. The weapons room is especially impressive. All of our children liked visiting the palace, but the most enthralled by it all was Aeryn. 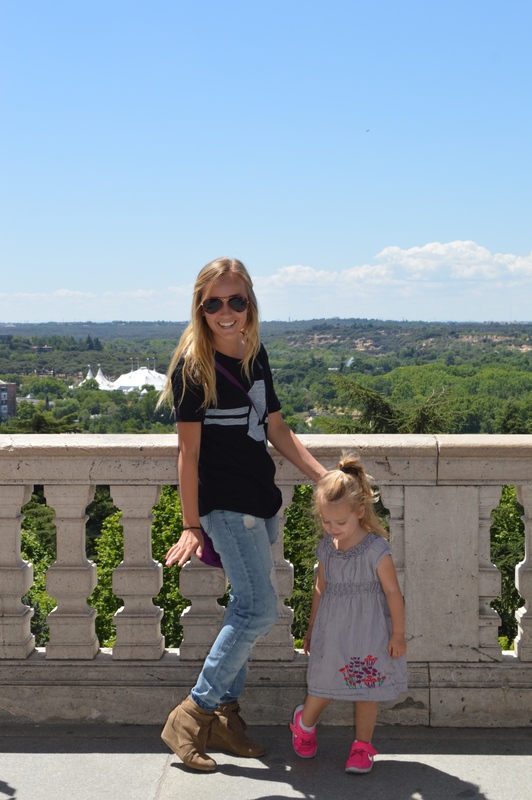 Here are Lexi, our babysitter, and our little Aeryn posing on the balcony overlooking Casa de Campo. This is one of Aeryn’s princess poses. The lifting of her heal and downcast eyes are very deliberate on her part. She will often clasp her hands together to complete the pose. My husband and I have wondered about how long our children will remain in that magical state of make believe where fairies and magic are real. Our oldest daughter is seven, and she truly believes that fairies are real. She builds communities for them to visit in our backyard. She makes treasures for them. She blissfully gathers flowers for them. At some point all of our little ones will transition to skeptical teenagers and young adults, but for now, we want the magic to last for them. So, with Abigail and Aeryn we talked about how they are not princesses of a country, but they are princesses in our family. We were visiting a palace that belonged to the King and Queen of Spain. Abigail and Aeryn both calmed down and seemed happy with that explanation. I guess Abigail had felt jealous and a little excluded. She really just wanted to be a princess, too. While preparing for our trip to Spain, I learned about kilometer zero. Considered the geographic center of Spain, the six major radial roads originating from Madrid are measured by their distance from this one spot. 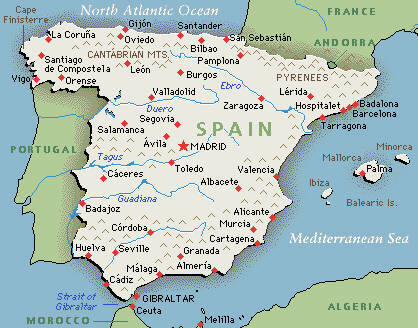 Many countries have their own kilometer zero, but in Spain, it is located in Madrid. When we set off on this beautiful morning, I hoped that we would find kilometer zero in our wanderings. We first took the metro from our hotel up to Puerta del Sol, a major plaza in the heart of Madrid. We emerged from the metro to find a beautiful open area with flowers, a fountain, and gorgeous buildings surrounding us. Puerta del Sol is a hot spot for interesting street performers. We were greeted by Mickey Mouse and other childhood favorites, all trying to sell us balloons and other treasures for children. This was one of the most interesting. Truthfully, I rather detest Barney as a character. 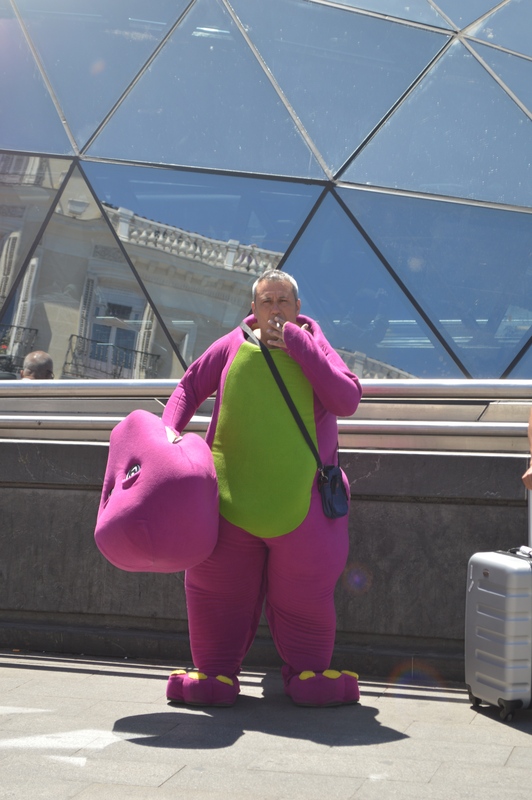 However, I couldn’t resist the irony of Barney smoking. If I had been ready with my camera just five seconds earlier, the picture would have showed Barney smoking with his head still on. It was a strange juxtaposition; a childhood icon engaging in destructive behavior. 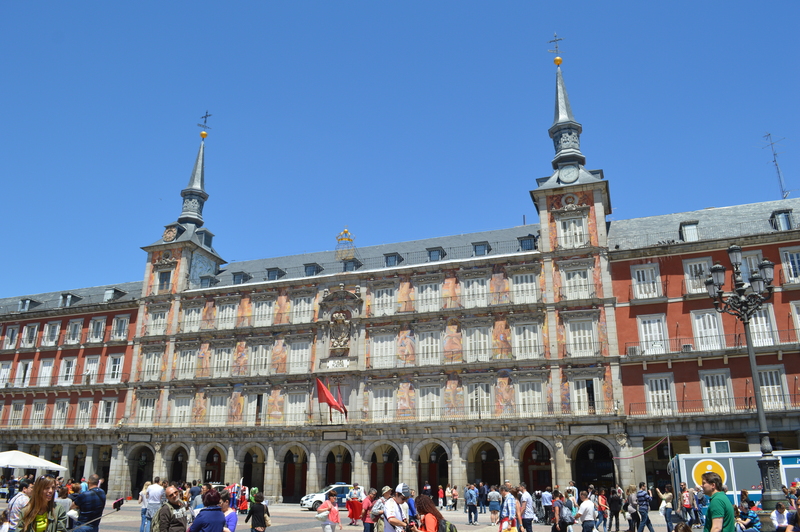 After enjoying the sights of Puerta del Sol, we made our way to Plaza Mayor. There is a tourist office there where we planned to buy Madrid cards for access to many of the sights and museums in Madrid. We were also looking for information on where to find Kilometer Zero. Plus, it is a major plaza in Madrid. We wouldn’t miss seeing it even if we had no other business to take us there other than enjoying the sights of the city. Plaza Mayor was built in the early 1600’s during the reign of Philip III. It was called by several different names during the centuries between Philip III and today. It was given the name of Plaza Mayor at the end of the Spanish Civil War. The plaza is beautiful, but more stoic than the piazzas in Italy. Most of the buildings around the plaza are built with the red brick, with one showcasing beautiful frescoes in a more pastel color. Beautiful archways ring the plaza, with larger archways leading out to pedestrian thoroughfares outside of Plaza Mayor. Our children were excited to chase pigeons in the big open space, but they were notoriously absent. There were a few here and there, called flying rats by waiters in the restaurants ringing the the plaza. There were, however, children kicking soccer balls back and forth, a sight we saw in many of the open plazas in Spain. In the bottom right corner of this picture you can see a modern portable building that looks very out of place in the midst of the historic square. This is the tourist office. The tourist office can provide you with maps and information about the city. It is also one of the few places where you can purchase a Madrid card for access to many attractions, and a tourist card which gives you unlimited rides on Madrid’s metro and bus system. 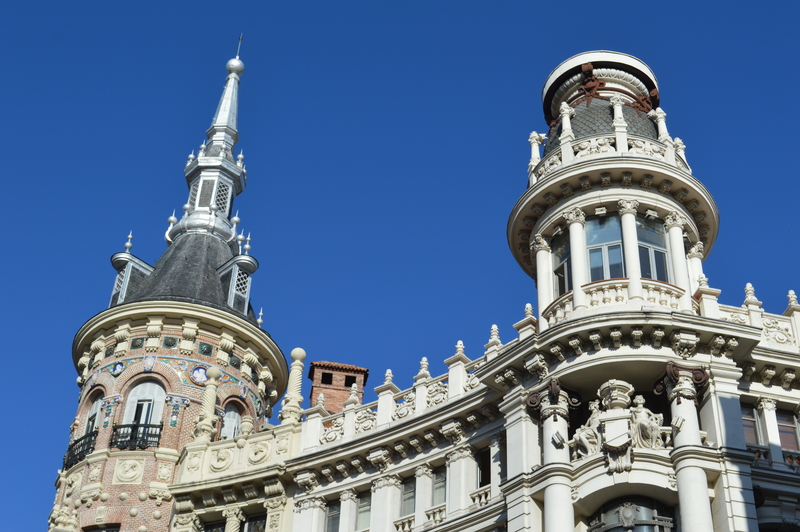 We purchased a three-day Madrid card, although you could spend weeks in Madrid and only see a small portion of all the sites available to you. We also learned that Kilometer Zero was back in Puerta del Sol. We would make our way back there that day, but we had a few other stops to make first. 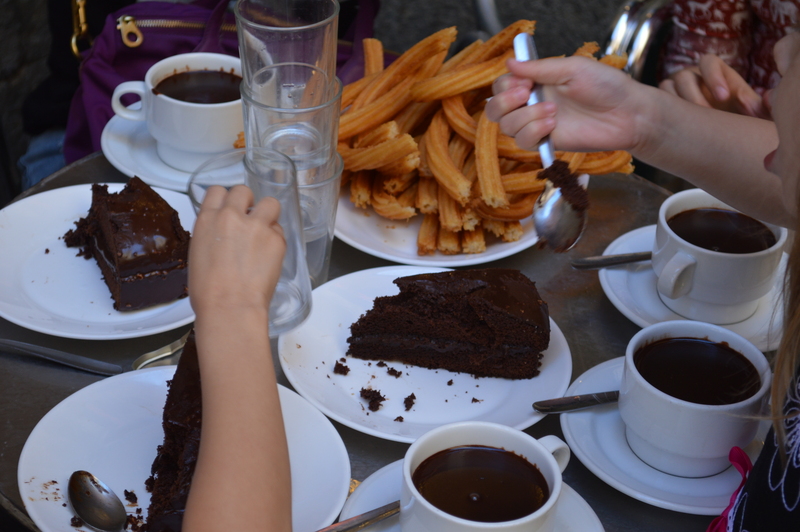 My husband looked forward to the experience of eating churros con chocolate with me and his children for a long time before we traveled to Spain. 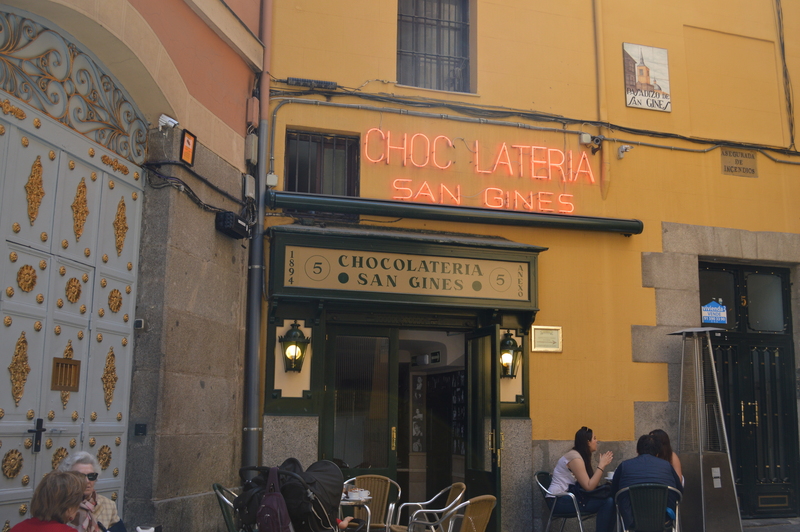 Here, on our first day in Madrid, he found a delicious chocolateria close to Plaza Mayor for us to enjoy this quintessential Spanish dessert. The chocolate cake was delicious. The churros were wonderful. The setting was magical. 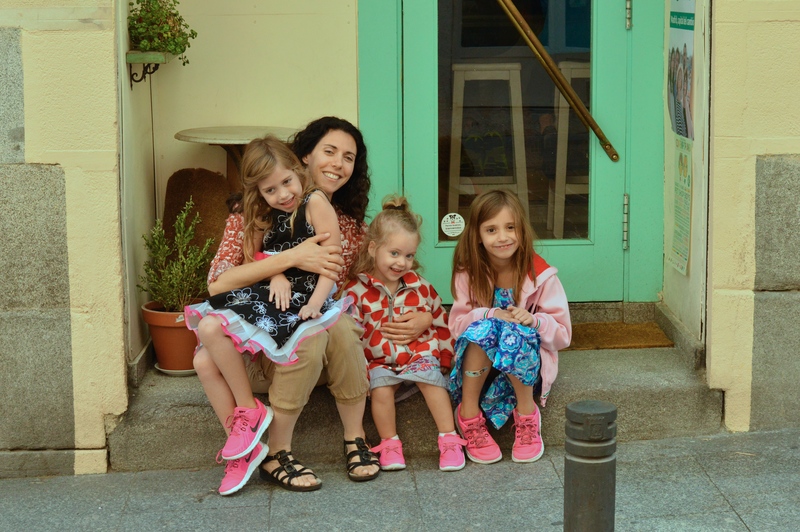 Tucked away in a side street of Madrid, we ate outside feasting on the sights of Spanish architecture and decorative elements while being serenaded by an opera singer followed by an accordion player, both of who were skilled at their craft. After eating we followed the street down to a pedestrian walkway where a small bookstore sold beautiful watercolors of matadors battling the bull and flamenco dancers twisting and stomping with flourishes and flair. Still in search of kilometer zero, we eventually made our way back to Puerta del Sol. It was later in the afternoon. It was crowded. My husband left the rest of us to battle the crowds and locate the kilometer marker we had come to find. In front of the clock tower on a building called “Real Casa de Correos”, which serves as the Spanish equivalent to the dropping of the ball in Time Square on New Year’s Eve, lies the marker of Kilometer Zero. There were many tourists standing around waiting for the turn to take pictures of the famous zero kilometer marker. 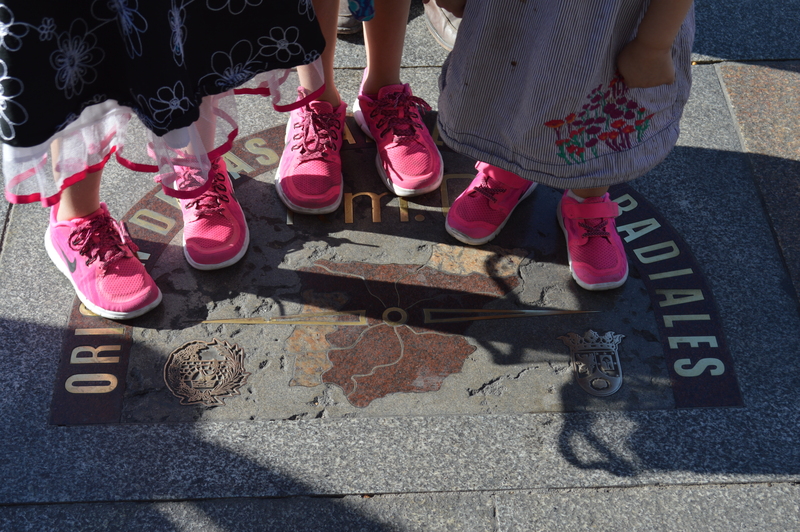 Our turn came, and my three beautiful daughters stood on the marker in their matching pink tennis shoes, solely to appease their mother. After we were finished taking the photo, I took a small moment to stand on the marker myself. I couldn’t come all this way and miss my chance to stand in the center of Spain, now could I? Why I am writing this blog…. Our first morning in Madrid, jet lagged and so very tired, we slept through the breakfast offered by our hotel. When we finally emerged from the bliss of sleep after a long day of traveling, we ventured out to find some food. Tucked away on a small side street several blocks from our hotel was a small cafe. We decided to give it a shot. It was a Saturday morning, and customers were leisurely eating their food and reading the morning paper. I love how customers brought their dogs into the cafe! There was one woman who sat at a table by the window drinking her coffee and reading the paper the entire time we were there. Her little beagle was curled up contentedly at her feet. They made such a picturesque site with the morning light streaming in through the window! It came time to order our food. My children were smart and went with the “classico”, which turned out to be toast with jam, a pretty safe choice. I was feeling a little adventurous, and decided to try the “espagnol”. I also tried to use what little Spanish I know to order orange juice as well. My husband amusedly smiled at my attempts. When I asked him what was so funny, I learned that in Spain juice is zumo, not jugo like in some other Spanish speaking countries. At least my orange juice came without any problems, so the waiter still understood me, even if I used the incorrect version of “juice”. And then the “espagnol” came. This culinary concoction was toast with diced tomatoes and jamon on it. Jamon is a Spanish ham that is cured, or cooked with chemicals instead of with heat. I was optimistic. I like ham and tomatoes. It turns out however, that jamon on a jet lagged and slightly queasy stomach is not a really good idea. I bravely took about three bites before deciding that to continue to eat my “espagnol” was a very bad idea. I ended up eating a croissant; a buttery, flaky, and completely safe croissant. Indeed, from that morning on, a croissant became a staple in my breakfast for our entire trip. So, my first experience with Spanish food wasn’t as successful as I would have liked. But the cafe was quaint. Everyone was energized for a day of site seeing. And that first foreign taste of Spain just made us more excited for the travel adventures to come.